What’s up in the night sky this month? Stargazing and looking up into the night sky is always a fun thing to do. This month, it will be especially exciting because there will be a total eclipse of a supermoon, plus the opportunity to see planets and the late-summer Milky Way! A supermoon is a new or full moon that occurs when it is at, or near its closest approach to Earth in a given orbit. There are usually 4 to 6 supermoons every year. 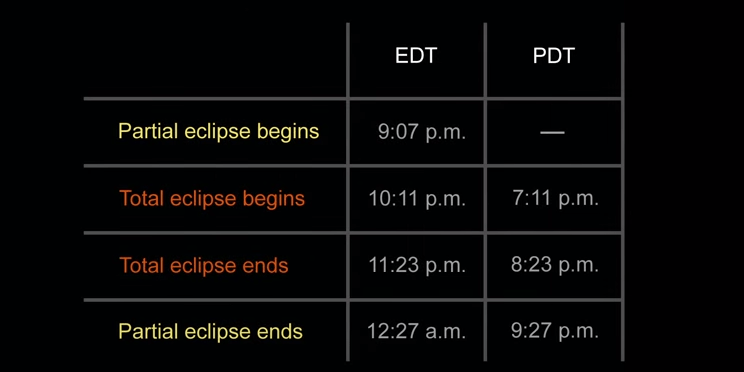 Observers can view the total eclipse on September 27, starting at 10:11 p.m. EDT until 11:23 p.m. This event will be visible in North and South America, as well as Europe and Africa. So make sure to mark your calendars! This month, you will also be able to see the planets! Look for Mercury, Saturn, Pluto and Neptune in the evening sky. Uranus and Neptune at midnight, and Venus, Mars and Jupiter in the pre-dawn sky. Finally, if you’re able to escape to a dark location, you might be able to see a great view of our Milky Way! So, make sure to get outside this month and take a look at everything our night sky has to offer. Source: What’s Up for September?